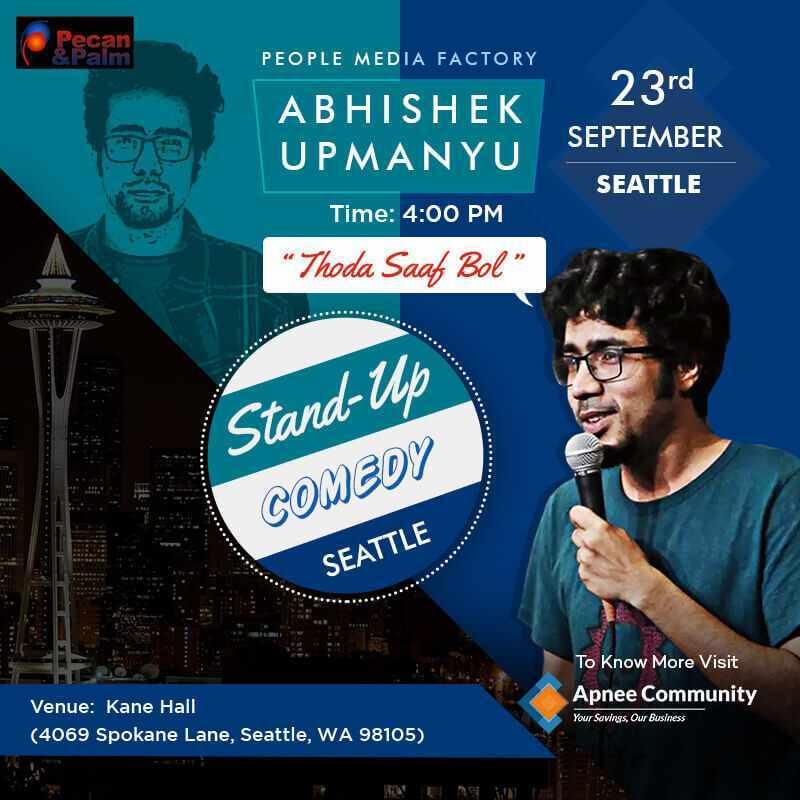 We are feeling delightful to add Pecan & Palm presentation 'Abhishek Upmanyu 2nd Comedy Show in Seattle'. Yeah, you heard it right. Due to the sold-out show in Seattle (6:00 PM), organizers decided to add another show on the same date (4:00 PM). If you missed booking the 6:00 PM show, it is the best opportunity to watch his comedy show live in Seattle in the 2nd show taking place at 4:00 PM. Sounds great? Both these comedy shows are the part Abhishek Upmanyu USA-Canada Tour. If you were browsing 'comedy shows near me', your search stops with ApneeCommunity. Abhishek Upmanyu is all set to showcase the world his brand new show 'Thoda Saaf Bol'. It is a one-hour comedy special that has gained a lot of appreciation from the Indian audience. Now, he is coming to the USA-Canada to entertain Indians settled up offshore. 'Thoda Saaf Bol' comedy show is very entertaining and will definitely make your evening funnier. The success of this young stand-up comedian from Indian is no mystery. He has been featured a several times in ScoopWhoop and numerous other media companies. No doubt, Abhishek Upmanyu has a bright future in the real of the comedy world. Don’t believe us? Watch any of his comedy show videos on his YouTube channel, you will know how much incredible he is. You will definitely get excited to watch him live after watching his video online. Don't want to miss this exciting show? Hurry up & book the event tickets in advance to avoid any last minute hassles. You can visit us for browsing 'upcoming events near me' as well as 'Indian Community Events in the USA'.